availability to go meet our accounts." The customized vending machine technology will revolutionize the availability of this product by offering it to energy-hungry consumers in places that are in need of energy chews and drinks - gyms, schools, libraries, repair shops, waiting rooms, just about anywhere will now have the convenience of Mad Dog Energy products at their fingertips. Experience the difference between the ordinary and this extraordinary home-based business opportunity with Mad Dog Energy Chews. The time has come. Are you ready? Vending is the largest home-based business in America, at more than $45 billion per year. Over the last fifty years, the industry has never experienced a "down" year. This long history has taught us many things about what determines success and failure in vending. If you're looking for a full or part-time small business opportunity that will start showing profits in weeks rather than months or years, then you've come to the right place. Vending route owners all over the country can vouch for what we say. Our company has been assisting people who've been in the vending business for years as well as brand new operators. We pride ourselves on our customer service and training. Our superior customer service is the reason for the perfect record we've held since 1985. 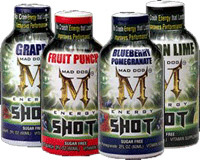 Distributors are now building Mad Dog Energy chew vending routes and energy shot vending routes all over the country. Areas are limited as we are currently searching for 3 distributors per 50,000 in population. This truly unique opportunity is a first in the dramatic energy drink distribution category. Sign Up For Your Free Sample Kit! To receive more information on this hot new vending opportunity and a free sample kit, just fill out and submit the form below today! Distributorships are limited. With energy marketing growing by leaps and bounds you will not want to pass up on this great opportunity! A Recession-Proof Vending Opportunity to Make Money and Achieve Great Returns! – a revolutionary, HIGH ENERGY, HIGH DEMAND PRODUCT! Recession - Inflation - Unemployment - Unpredictable Stock Market - Real Estate Woes? Not a problem when you have a profitable home-based business of your own. Mad Dog Energy Chews is an exceptional energy product for a quick, long-lasting energy boost with none of the peaks and valleys associated with coffee and traditional canned energy drinks. This proprietary blend of energy generating ingredients – B vitamins, taurine and caffeine – supply the same amount of energy as a full cup of coffee. Great, ALL CASH income, from one of the fastest growing products in vending. "Energy is so hot as an overall category that to me the fact that there's another way to do it besides liquids is such a given, it's incredible!" Start your own vending business with this unique product that no one else has! Be one of the first and get the very best location for your machines with this ground floor opportunity.